We’d love your help. 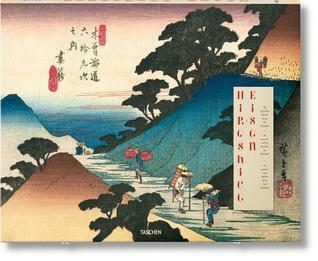 Let us know what’s wrong with this preview of Hiroshige & Eisen. The Sixty-Nine Stations along the Kisokaido by Andreas Marks. The Kisokaidō route through Japan was ordained in the early 1600s by the country’s then-ruler Tokugawa Ieyasu, who decreed that staging posts be installed along the length of the arduous passage between Edo (present-day Tokyo) and Kyoto. Inns, shops, and restaurants were established to provide sustenance and lodging to weary travelers. In 1835, renowned woodblock print art The Kisokaidō route through Japan was ordained in the early 1600s by the country’s then-ruler Tokugawa Ieyasu, who decreed that staging posts be installed along the length of the arduous passage between Edo (present-day Tokyo) and Kyoto. Inns, shops, and restaurants were established to provide sustenance and lodging to weary travelers. In 1835, renowned woodblock print artist Keisai Eisen was commissioned to create a series of works to chart the Kisokaidō journey. After producing 24 prints, Eisen was replaced by Utagawa Hiroshige, who completed the series of 70 prints in 1838. To ask other readers questions about Hiroshige & Eisen. The Sixty-Nine Stations along the Kisokaido, please sign up.